The secret to this perfect apple tart is to using Granny Smith apples for the tart crisp flavor and Golden Delicious apples for the sweetness! Place sliced apples in a large bowl and set aside. In a medium size saucepan add apple juice concentrate and bring to a boil. Add ½ the sliced apples to the hot juice and let cook until tender but still holding their shape (about 4 minutes). With a slotted spoon remove the cooked apples from the juice and add the rest of the sliced apples to the hot juice and repeat the 4-minute cooking time. Remove the second batch of cooked apples and place all the cooked apples in a bowl, and toss cooked apples with cinnamon, set aside apples. Continue to bring the hot juice to a boil over medium heat on the stove. In a small bowl mix three tablespoons of cornstarch and 1-½ cups of cold water together. Stir with a spoon until cornstarch is dissolved and the mixture looks like milk. Add cornstarch mixture to the hot juice on the stove and stir. Bring the mixture to a boil and continue stirring until the juice is thick and transparent (it should look like a shiny glaze). Remove apple glaze from the stove and pour over cooked apples. Set aside while making the tart crust. In a large mixing bowl add flour, salt and Crisco. Cut the Crisco into the flour using two knives. Dough should be crumbly. In a small bowl mix 2/3 cups of flour with enough hot water to resemble smooth Cream of Wheat. Pour water-flour mixture into the flour and shortening and using a fork stir to form a soft ball. Divide dough into two smooth balls. On a floured board and with a floured rolling pin, roll dough out to form two 16-inch circles (the edges will be ragged). Place rolled out dough rounds inside two 10-12 inch pie or tart pans (allow the excess dough to hang over the pie pan rim). 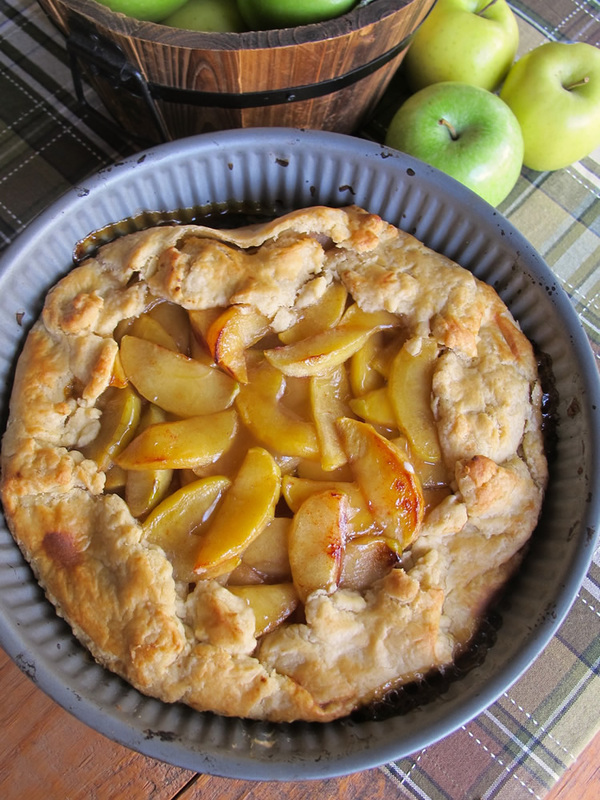 Place half of the apple mixture onto each crust and fold excess crust over filling. For a shiny crust brush the unbaked crust with a little milk. Place tarts on a foil lined baking sheet and place in a hot 425-degree oven. Bake tarts for 45 minutes or until crust is a golden brown and the filling is bubbling.